This involves carrying the yarn not in use loosely across the back of the work. It is best not to carry over more than three stitches at a time to avoid loops that can get caught. 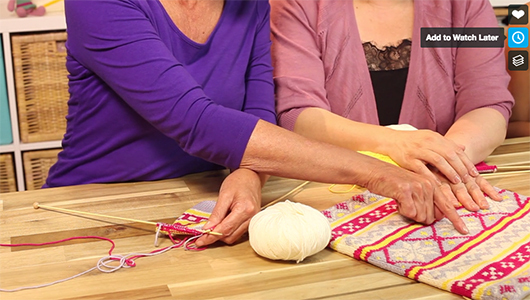 On a knit row, insert the right needle into next stitch working with the first color. Then, when changing colors pick up the second color, take it under the first color and knit the next stitches. Change back to first color and, taking it over the second color, work the next stitches. Repeat, making sure that the same color is taken under, and the same color over. This will stop the yarns from tangling. Keep the work on the right needle spread out to avoid the work from pulling in and to keep the work elastic. Repeat, making sure that the same color is taken under and the same color over. 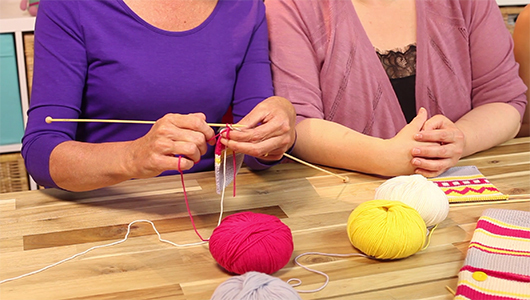 To keep the fabric in the same thickness throughout, take both yarns to the end of the row. To do this, take the yarn not in use over the one to be worked and catch.